Bagged salads and pre-sliced or pre-chopped produce are even more expensive. Consumers often pay about 35% more compared to buying the whole fruit or vegetable. Chopping your own veggies only takes a few minutes—is it really worth paying extra for the service? Are you shopping for pre-formed burger patties or cubed meats? 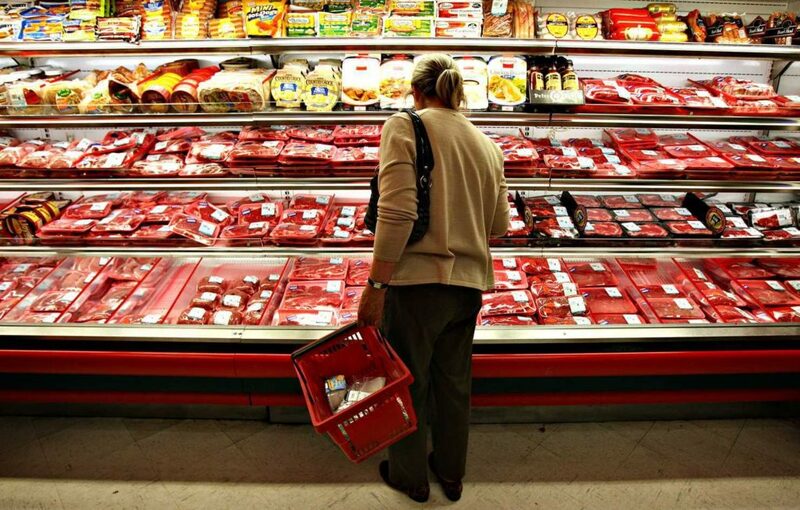 Since meats have a 5-day refrigerated shelf life, most grocery store meat sections have a minimum of a 30% markup. Chuck and ground meat are often marked up about 60%, while lesser pieces of meat used for stews can even have a markup as high as 300%. If you want to save some money, shop for bigger slabs of meat and ask the butcher to chop it up in smaller pieces for you (for free! ), or look for meats that are marked down. You can also buy meats in bulk in places such as Costco or Sam’s Club, or bulk distributors like Zaycon Foods, then refrigerate or freeze what you don’t use right away for later on. Who needs overly expensive bottled water when you can safely drink water straight from the tap in most towns? It may seem outrageous, but bottled water just isn’t overpriced by a little—it has a 4,000% markup. Yes, 4,000%. It’s bad for the environment, too! Save a bundle by carrying a reusable bottle instead. Batteries in the grocery store are marked up by as much as 60 to 70%, so keep in mind that you’ll typically get a better deal at Walmart and Target. To save even more money, you can start buying batteries in bulk at Costco or Sam’s Club. You can even get great deals on batteries at Amazon, which is where I buy all of our batteries. I bought a water pitcher with a filter so I NEVER waste money on bottled water now!